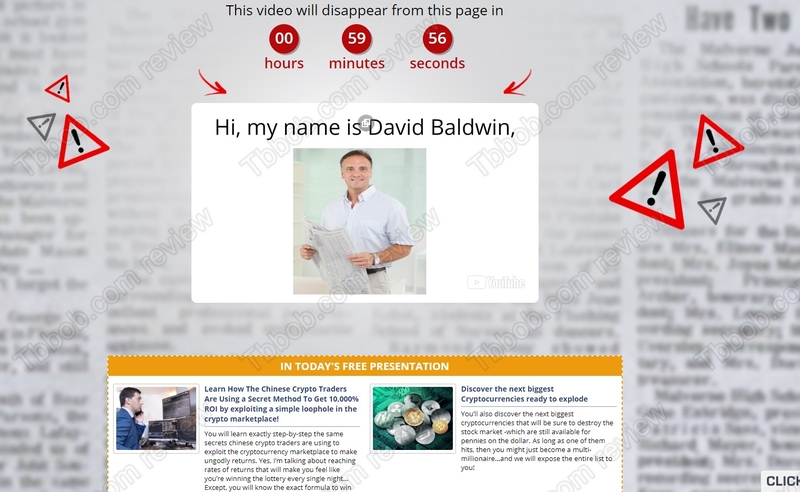 In this review you will learn that Crypto Destroyer of David Baldwin is a scam. Baldwin says he is a former investment analyst and head researcher at Crypto Destroyer. He allegedly developed a trading method for cryptocurrencies that can make you hundreds of percent in just 24 hours. He is selling his Crypto Destroyer system for $97, so is it worth it? The truth is that David Baldwin is a scammer and Crypto Destroyer is a scam. Let’s start with Baldwin. As you can see on our picture, his photo is a stock photo, so we have every reason to believe that he is a fictitious character created for the purpose of this scam. We have reviewed hundreds of investment scams, so we know that the real owners of scams like to keep their anonymity. There certainly is not a professional analyst behind Crypto Destroyer. Another proof that Crypto Destroyer is a scam is in the fake reviews Baldwin is showing on his website. Check our picture to see that the testimonials were fabricated with stock photos. Baldwin says that Crypto Destroyer is a trading method, he is selling it, so he is selling investment advice. For this he needs a license, because providing investment advice is a regulated activity. But Baldwin doesn’t even provide any contact information, so he obviously has no licence, therefore he is acting illegally. The thing with all these crypto gurus is that they show you historical charts and say things like: If you invested back then… Anybody can say these things. But where were they back then? The hindsight gurus, as we like to call them, also don’t like mentioning that cryptocurrencies are on a down trend since the beginning of this year. That’s not to say they won’t rise again, but not showing you what is going on right now is not honest. Crypto Destroyer just wants your money. Baldwin knows that some people will ask for a refund, because he is selling crap, but some people will just let it be, and that will be his income. Crypto Destroyer is a crypto scam, don’t buy this piece of crap! If you want to try to make money in crypto trading, start on a free demo account and test and learn to see what works. Also, realize that you can make money, but also lose, so be careful with your investments.